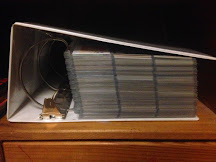 Collecting baseball cards is like dealing with the chicken pox. No, not in the literal sense - I don't have little Topps and Panini logos popping up on my skin. However, metaphorically speaking, in collecting cards, I constantly feel like I have a bunch of "itches" to do different things within the hobby or pursue different goals within the field and to scratch them all would be detrimental to my health (or wallet). That said, sometimes these itches get far too intense for me to continue to ignore and I can't help myself but to scratch... and oven mitts and lotion don't help. Last night, while making a late night Target run, one of those itches manifested and with my fingers I did scratch. I used those fingers to pull a random pack of the latest edition of Bowman out of a gravity feeder, a pack which had obviously been searched. In fact, every single pack in the box had obviously been aggressively felt up by some aggravating pack searcher. But, that's a tangent I'm not prepared to go on at this moment... argh!! Anyway, I was hoping to locate some packs of the latest product to hit the retail shelves, the second coming of Bunt; unfortunately, like always with my local big boxers, they've been super slow to get the new product out on the shelves. 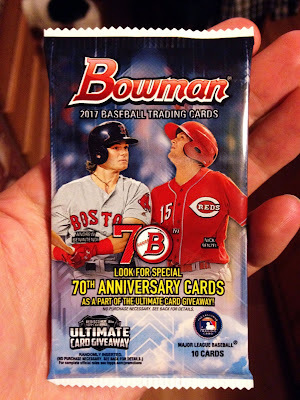 Nevertheless, I still felt an overwhelming itch to rip into a pack of cards and I hadn't sampled this year's Bowman yet. With that in mind, Topps prospect-heavy product was the scratcher. 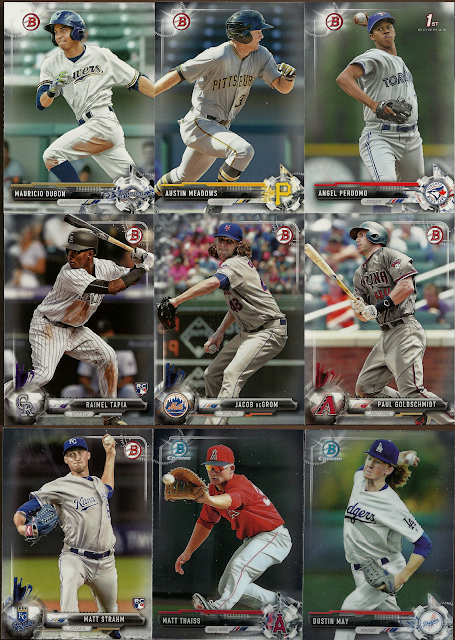 As far as content goes, there wasn't any cards I was hoping to hit in Bowman this year or any chase cards, per se. That said, I wouldn't have minded scoring a nice Eloy Jimenez card or an Oscar de la Cruz, a top prospect making his mainstream card set debut. Both are on an MLB track and I'd like to have some cards set aside for my CATRC if they make the ultimate ascent. I could tell you one thing for sure, though - I wasn't going to get any hits out of my purchase (curse you, searchers!). While I didn't land Jimenez, de la Cruz, or any hits, I did walk away with one Cubs card and a nice Anthony Rizzo one, at that. Anytime I pull any Cubs card from a single, impulsively bought retail pack, I consider that a victory, in and of itself. The design of this year's Bowman isn't bad; although, if last year's flagship set was the "TV graphics" set, this layout is the "TV Graphics on Steroids" set. Seriously, I can almost hear the Sportscenter theme blaring in the background as I gaze at this card. I don't hate it though - at least it differentiates itself from the previous editions of the product, which is something you really can't say about the last few years of Bowman. One thing irks me though: that weird, pseudo-embossed thing going on in the upper right corner. What purpose does that serve? Was each card notarized before being packed up? Anywho, let's flip this bad boy over and take a look at the back. The team color coding in the background is a nice touch and a characteristic I welcome anywhere on any set. 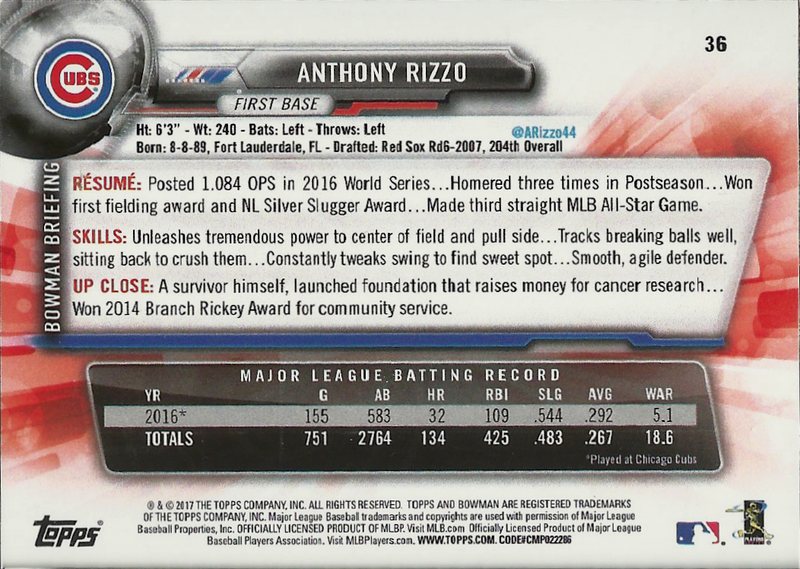 We also get the normal "Bowman Briefing" write-up and prerequisite single year line of stats, as well. Additionally, like 2017 Flagship, Bowman recognizes the continually growing influence of social media by including the depicted player's Twitter handle, if they have one. All told, nothing crazily different here. Like I said, the Rizzo was the only Cubs card I was so fortunate as to pull; so, here's the rest of what resided within my itch-scratching pack rip. We have a pair of established Major Leaguers in DeGrom and Rizzo's main rival for premier NL first baseman, Goldschmidt, a couple of rookie cards in Strahm and Tapia that I, admittedly, know nothing about, and a bunch of prospects - a couple of which are all chromed up. I hear that Austin Meadows kid is pretty good and is all but a sure thing to give us Cubs fans fits in future NL Central races. I'm not attached to any of these cards (except the Rizz) at all; so, if any of them catch your fancy, just shoot me a line and they are all yours. I know I'm quite a bit behind when it comes to sending out trade packages; but, I assure you that if you are expecting something from me, said package will be hitting the mail in the near future. Sorry for the delay! Overall, I'd say that this little impulse purchase successfully scratched that pack-ripping itch. 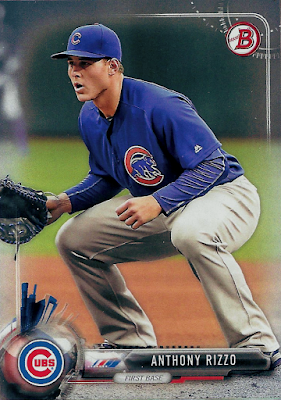 Like I said, any time I actually pull a Cubs card out of a pack, I consider that endeavor to have been a success. Furthermore, I actually kind of like this hyped-up TV graphics design for Bowman, as it differentiates it from the previous years of sets, which run together like one big, white-bordered blur. That said, I still kind of wish that I'd bumped into Bunt. At $2.99 for 10 cards, Bowman isn't the best deal on value and I still haven't seen the new design for Bunt yet, so I'm extremely curious. But, I can't complain too much with my purchase. Here's hoping that the next itch that proves to strong to ignore is just as harmless and satisfying. I hear ya on the multiple itches. I almost feel priced out of the market for current cards (Chicagoland prices on Cubs cards have reached the East Coast!) and have been spending that energy on my side collections (ivy, horizontals, customs, etc.) and yet another attempt at getting organized. Great analogy on the itchiness of cards! Looking forward to Bunt 17 as well. I have a box in the mail set to arrive.